Mercedes have presented themselves as the underdogs for the Italian GP but vowed not to surrender to Ferrari without a fight. And setting the scene for a three-way fight at Monza, Sebastian Vettel has insisted he expects Scuderia team-mate Kimi Raikkonen to be allowed to fight him for the win. After dominating the sport for the last four years, Mercedes currently find themselves in the unusual position of looking on enviously at the speed of one of their rivals. Raikkonen's pole position at Monza, the fastest lap in F1 history, means Ferrari have been quickest in every dry session since the summer break. "Everyone in our team is working as hard as they can to make a difference," said Hamilton. "It's obviously incredibly close between us but they've had the upper hand all weekend. We gave it everything we could today and we'll give more tomorrow. "I'm really proud of my guys for pushing this hard - we've squeezed absolutely everything out of the car today." 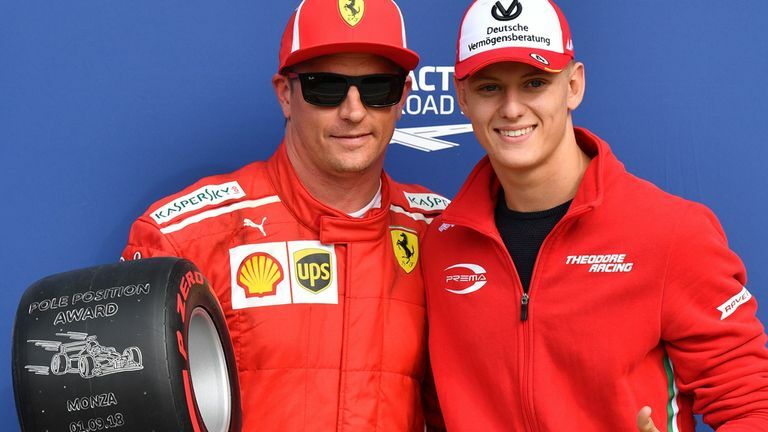 Speaking on Sky F1, Nico Rosberg suggested his former team-mate had performed "phenomenally" simply to give Ferrari such a close fight and be within two tenths of pole. In the other Mercedes car, Valtteri Bottas was over half a second distant of Raikkonen. "I'm really happy with the performance this weekend but we just need that little bit more," said Hamilton. "At the end of the day Kimi did the job, I don't think I could have gone any quicker. I am putting it to the edge." Mercedes have admitted for several months that Ferrari now boast the fastest engine in F1. But after being soundly beaten in Belgium just a week ago, Mercedes appear to be far more competitive this weekend, with Hamilton beaten by just 0.175 seconds in this Saturday's qualifying hour. Asked if his team could still win on Sunday, Mercedes boss Toto Wolff's response was emphatic: "Absolutely." Raikkonen's pole position was his first of the year and seemingly sat uneasily with Vettel. "Clearly I wasn't happy - but I don't tell you why," he said. Although Vettel is just 17 points behind championship leader Hamilton in the standings, it was Raikkonen rather than the German who benefited from an aerodynamic 'tow' in the critical final stages. But how will Vettel and Raikkonen play it into the first corner, with Hamilton lurking behind? "It's no different than any other race," said Raikkonen. "We know as a team we can race but obviously we need to be careful with each other. I don't see why it changes, I don't think anybody purposefully wants to take a stupid amount of risk to damage your cars and theirs." And Vettel added: "Of course you are always trying to get out ahead no matter who you're racing, but for sure you try to avoid contact. With our cars you can't really afford to touch or be touched." The four-time world champion also denied a suggestion that Raikkonen would not be permitted to fight him for victory. "If he's starting from pole I guess he's allowed to win," countered Vettel. "It's a long race. Obviously he wants to win, I want to win, and hopefully one of us will win."